It reads "Remember. Stop for red". I've never stopped for red here, unless pedestrians are crossing. Sue me. 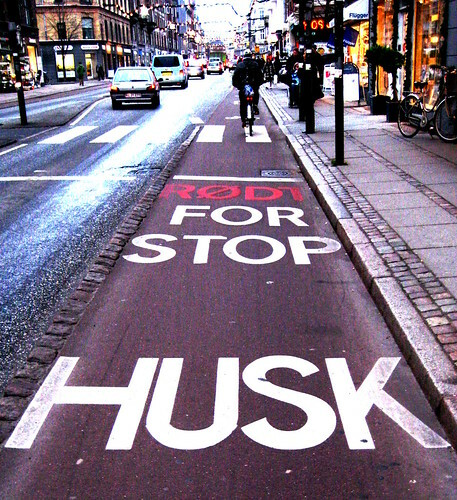 Here's a blogpost from a while back about a previous, symbolic 'bike raid week' in the Danish capital in 2007. So, if you're riding around the city this week, chill. Wait until next week to navigate along your "Desire Lines" and experiment with the anthropolgical mapmaking of your personal urban mobility routes. Save your rolling casually across zebra crossings, turning right on red lights when there are no pedestrians in sight - and all the other bits and pieces - until next week. A fine will set you back 500 kroner [$100]. Money better spent in cafés and bars in the spring and summer months. I've been peering closely at this bicycle culture for over three years. Documenting it in photos and on this blog daily. 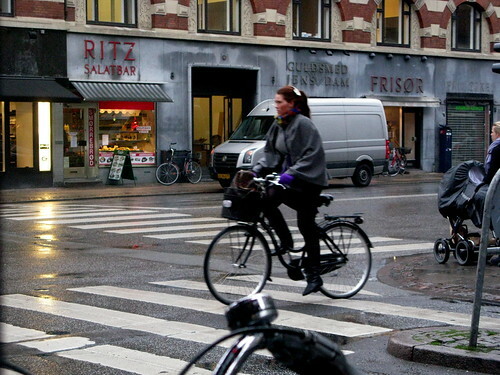 It is so incredibly rare that I ever see Copenhageners on bicycles blowing through a zebra crossing, sending pedestrians scrambling or flying across an intersection and causing cars to screech to a halt, like I see in other cities. I see cyclists rolling across zebra crossings, sure. I see cyclists turning right on red, sure. I do it myself every single day. But it is hardly ever at the expense of other traffic users. It is almost always at a pedestrian pace. The Great Structural Fabric of Society does not fray at the edges when Copenhageners or Danes do such minor things anymore than it does when pedestrians cross against the light.